Flying with Guide dogs, sometimes referred to as Service or Assistance Dogs, will always be subject to quarantine laws, and will only be permitted to fly following clearance. This will involve obtaining the correct veterinary certification prior to flying. An airline is not permitted to deny access of guide dog, if the animal has all the appropriate identification. Always check with your airline in advance to see what documentation is required. 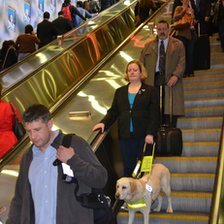 For the duration of the flight, Guide Dogs must observe a number of safety regulations, for example, they must not obstruct aisles, as this is deemed a hazard in an emergency situation. Once your Guide Dog has been cleared for travel, flying with your dog should be at no additional expense, and is not considered in the same category as flying with pets. According to Civil Aviation Regulations, dogs “accompanying a visually impaired or hearing impaired person as a guide or an assistant” are allowed on planes; all other service animals must fly in cargo unless the airline has received written permission from the Australian Civil Aviation Safety Authority (CASA). If you are bringing a service dog to Australia, it will not be subject to the standard 30-day quarantine period as long as you and the dog meet the criteria specified by the Australian Quarantine and Inspection Service. Guide dogs, hearing guide dogs, and guide dogs in-training can travel for free on all public transport services. 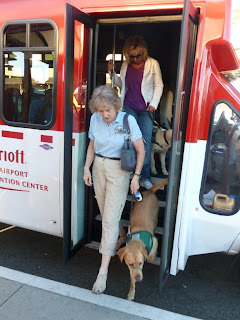 Other service animals may be allowed to use public transit, but you will need to obtain an Assistance Animal Pass in the state you are visiting. Contact details for these can be found within the information provided in the page dedicated to the particular state. Guide dogs for people with vision and hearing impairments are permitted in public spaces and businesses. They are not considered pets and are not subject to “no pets allowed” regulations.